You Are Here: Home >> Solar Equipment >> How Many Solar Panels Can Fit on My Roof? How Many Solar Panels Can Fit on My Roof? Here is another question that everyone wants to know. How many panels can get up there on the roof? Of course the answer is different for each home. But, it is relatively easy to get a good idea by doing some simple math that anyone can do on their own. The average solar which is either 175 watts, or 200 watt panels is about 5ft by 3ft. So that is about 15 sq. feet per solar panel. These actual numbers are a tiny bit larger than the most common sizes, but they work well for rough measurement purposes. So if each X is a solar panel, there is more than enough room for 24 panels. This would even leave 2 1/2 feet of space on the top and bottom, and 3 feet of space on the sides. It is best to have some space around the outside of the panels to work with, also many local building codes require space around the solar panels for the fire department to have for walking space in the event that a fire does happen. ***Most important, make sure to check if there are any non standard building codes in your area. 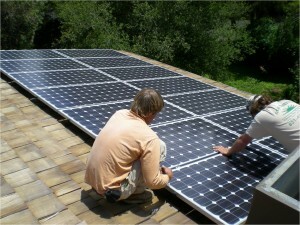 A local solar professional should be able to help you out with this type of question. But, be wary if someone tells you that you should put panels all over the roof, and completely cover it, that is not a good idea. Great, practical info in this post! I like to give people the 100 sq ft per kilowatt rule of thumb–since there are so many different sizes of panels out there (not to mention nearly limitless configurations possible, if you know what you’re doing or working with an installer who does), you should be able to find a solution for your roof even if it’s irregularly sized.